Menopause can be a difficult time for many women, marking the end of part of a cycle. It is an often uncomfortable transitional period lasting many years. Many of the women I love are currently experiencing menopause right now, and I thought I could help support their journey with a homemade cooling spray. The idea behind this spray is to combine infusions of cooling herbs and essential oils. The oils also help to provide a bit of hormonal support that a menopausal woman can greatly benefit from. The combination aims to bring relief during the hot flashes that seem to be the chief complaints of both of my mothers and one of my best friends. 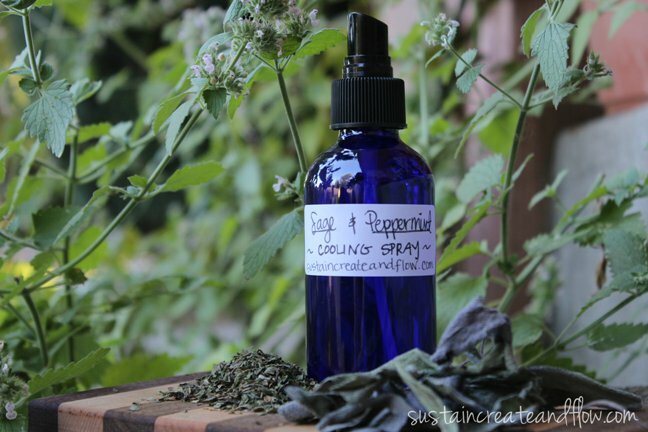 This spray showcases sage and peppermint, two magnificently cooling herbs. In fact, this cooling spray will work fantasticly for most everyone, but not for those of us who are nursing (or pregnant), since sage is used to help in the weaning process. It is easy to make, versatile in what oils you can add, and can be tucked away in your purse or at your desk, or both. I recommend making a few bottles of this stuff and for an added benefit, leaving the one at home in the fridge. For those of you not in menopause, but suffering heat waves in the last surges of summer, this spray will also be a friend to you as well. This recipe is for a 4 oz. mister pump spray bottle. Dark colored glass will be best for this recipe to extend shelf life. Note: I get my glass spray bottles here. 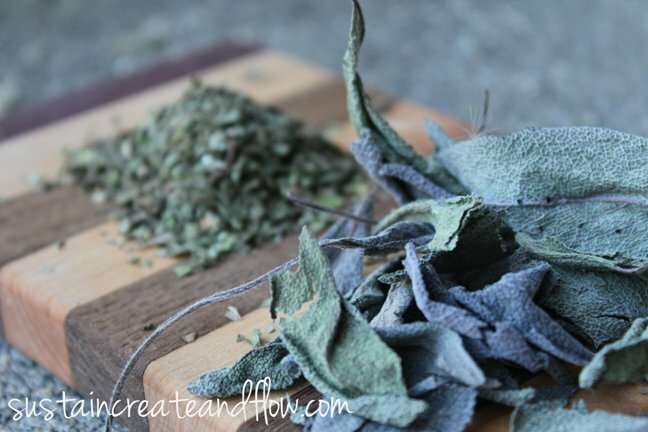 Add boiling water to your sage and peppermint. Steep until completely cool and strain herbs out with cheesecloth or mesh strainer . For best results, combine herbal infusion and all other ingredients in a dark colored glass bottle and shake vigorously. (In a pinch, you can use any spray bottle you have, but some essential oil experts do not recommend using EO’s with plastic. Use your own discretion). What strategies do you use to make yourself more comfortable during menopause? Lets chat in the comments below, or continue the conversation on facebook. Pin this Post to share this helpful remedy with all of your friends! Can you explain a bit more about how to use this? Where do you spray? Neck? Chest? Abdomen? Soft tissue of arms? Inner thighs? Or simply anywhere? Thanks. hi my “summers” are a nightmare at work! i feel so sorry for my coworkers. i am going to give this one a try. Anything with water in it – even stored in the fridge – WILL, sooner or later, breed new and icky life forms without some kind of preservative. I’ve made things like these for myself, friends and family for years, but I always, without exception, include <1% of a paraben-free and formaldehyde-free preservative from a soap/cosmetic supplier, because I'd rather be safe than sorry. Another herb you might like to use in this is Chickweed, it’s very cooling and safe.